There aren’t many online slots with horse racing as their theme but we’ve found them to be generally of a high quality and offering some really clever bonus features – Net Entertainment’s Day At The Races for example. 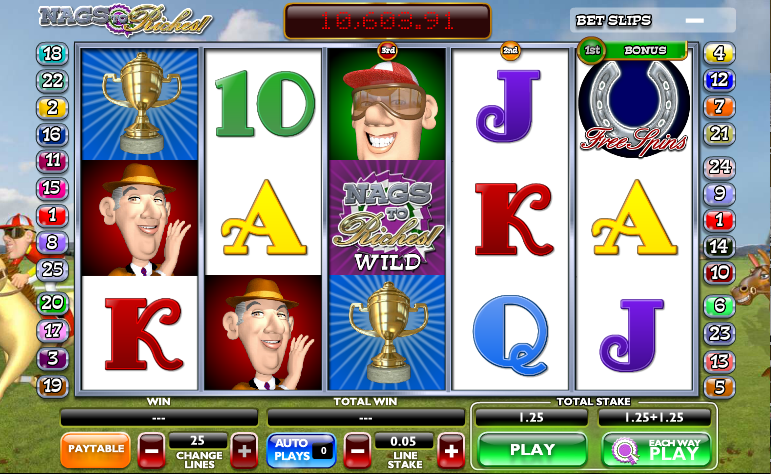 Nags To Riches from Ash Gaming has now joined that club, boasting several bonus features and a progressive jackpot. 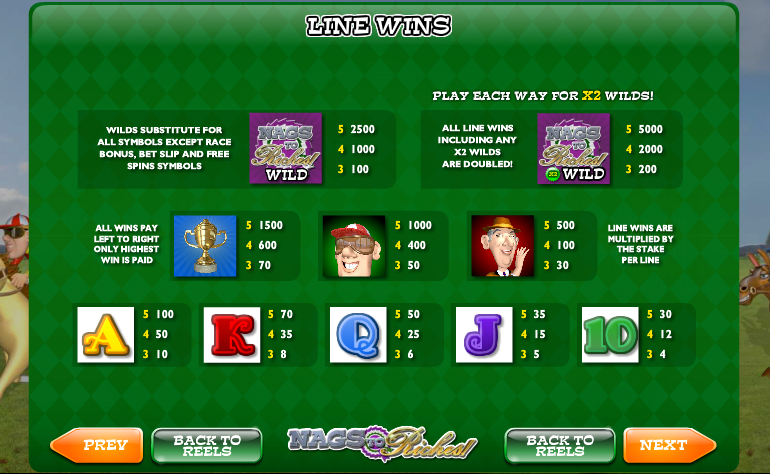 Nags To Riches plays out over five reels, three rows and up to twenty five paylines; the graphics are quite basic but there are some horses visible in the background in front of a setting sun. There are three high value base game symbols – the bookie, the jockey and the gold cup – with 10, J, Q, K and A making up the remainder. The Nags To Riches logo is wild and there are three bonus symbols – the horse, the betslip and the horseshoe – which activate their respective bonus features. This is an option named after a betting term which allows players to activate payline from right to left as well as left to right. The stake is doubled of course but so are all the prizes, meaning for example that you will receive twice the number of free spins in that particular round. Betslips appear on the centre reel only and will name a horse which will run in the next race (when you trigger that bonus). If that horse wins the race you will be awarded the amount on the betslip. You can collect more than one betslip before a race. This is a two part affair and first you must land the horse symbol on reel one. It will now dash across the screen and where it ends up determines whether you qualify for the next stage or not. In standard play the horse must reach reel five, in each way play reel three id far enough. If you qualify you will be taken to a screen and asked to pick one of the eight owners. Each is worth a different multiplier if their respective horse wins the race – the higher the multiplier the less likely it is to win and vice versa. The better your horse does in the race, the more you win on top of any betslip wins. Three horseshoe symbols anywhere in view on reels one, three and five will grant you ten free spins (or twenty playing each way) and a 2x multiplier for any wins. This feature can be re-triggered up to 200 & 400 spins respectively. A golden betslip on reel three awards the big bucks instantly. Go for the each way play, it makes everything more exciting and you’ll have a better chance of triggering the race bonus round. There’s loads going on here which is always good to see and the race bonus is well-designed although we found the bonuses a little hard to trigger. We also like the addition of a progressive jackpot.